Do you need customized export controls training for your personnel on the Export Administration Regulations (EAR), International Traffic in Arms Regulations (ITAR), Office of Foreign Assets (OFAC) Regulations? Do your personnel understand their role in supporting export compliance? Are you in need of customized and creative training material to engage your personnel? The U.S export control regulations are complex. Our consultants break it down into plain speak so your employees, contractors, and other staff can learn what they need to know – for your specific site, organization, and industry. We offer unique training materials, including videos and innovative presentations on basic and advanced export compliance topics. 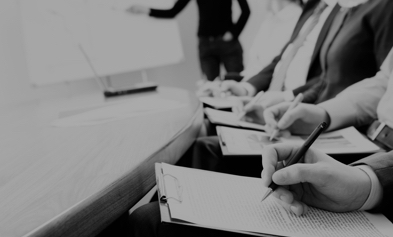 Our customized export controls training packages send concise and effective key messages to a wide range of audiences. Training including faculty, researchers, engineers, business leaders, and personnel in associated departments such as IT, supply chain, manufacturing, human resources, or research administration. We can deliver virtual training in a cost-effective manner to a wide global audience, or alternatively in-person training to help drive a more interactive learning environment. Do your international trade compliance leaders need help understanding specific parts of the regulations? Whether your compliance staff needs a regulatory refresher or how-to training about a deeper export compliance topic, we can help through our Train-the-Trainer Program. Our consultants will help your team sharpen their skills on export classifications, BIS licenses and license exceptions, the fundamental research exclusion, the publicly available exclusion, DDTC licenses and agreements, OFAC sanctions, and more – without leaving their office. “Dr. Jennifer Saak and Mr. Mark Peters from Traliance taught a full day training seminar on export control compliance for faculty, students and staff at Dartmouth. The program included a general plenary session and four breakout discussion groups on a variety of topics relevant to the Dartmouth community. We were extremely pleased with the outcome and feedback from participants was very positive.